Stereotypes. Caricatures. That’s the face of black men children see in the media far too often. That’s if they see them at all. In 1953, Ralph Ellison’s Invisible Man won the National Book Award. But in many ways, even with our nation being led by an African-American president, recurrent positive images of black men are still missing from literature and popular culture. 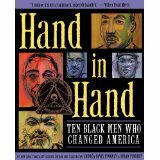 That’s why the stunning book, Hand in Hand: Ten Black Men Who Changed America (Disney/Jump at the Sun), written by editor and acclaimed author Andrea Davis Pinkney and illustrated by her husband, award-winning artist Brian Pinkney, is so important. The book begins with a stirring poem whose words “Reaching . . . Pulling . . .” set the tone for the stories of men who pushed for freedom, fought for justice and reached out to help others. In the preface, Pinkney shares how a circle of teens, “Brother Authors,” inspired her to create this poignant collection that salutes the lives of 10 visionaries and pioneers. “They were hungry for role models,” she wrote of the young men she met. “They wanted shoulders to stand on.” With Hand in Hand, she gave them and children everywhere an amazing gift. Winner of the Coretta Scott King Author Award, this is no ordinary assemblage of biographies. Laced with poems speaking to the power of each trailblazer’s hands and evocative paintings that honor their beautiful spirits, Hand in Hand is a celebration. Arranged chronologically, Pinkney creates a chain of hands that stretches from Benjamin Banneker to President Barack Obama. She shares their stories from childhood to adulthood, deftly exploring their challenges and triumphs. As I read the story of each man – each a link in Pinkney’s great literary chain – I thought about a painting called He Ain’t Heavy by Gilbert Young. In it, Young depicts an African-American man reaching down to grasp the outstretched hand of another brother. The message in the picture and Pinkney’s book is clear: Each generation is pulled up by the one before. Pinkney’s book is like a mighty hand reaching out to help young people rise and soar. Her words and her husband’s art will inspire readers of all backgrounds and ages to climb and give back as they soak in the stories of amazing black men who changed the nation through their faith, vision and hard work. Thank you for a great book review. We need much, much more literature of this quality and subject matter. Not just once a year, either!